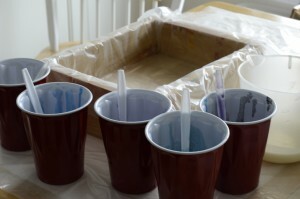 It has been a couple months since I participated in Amy Warden’s soap challenge club. 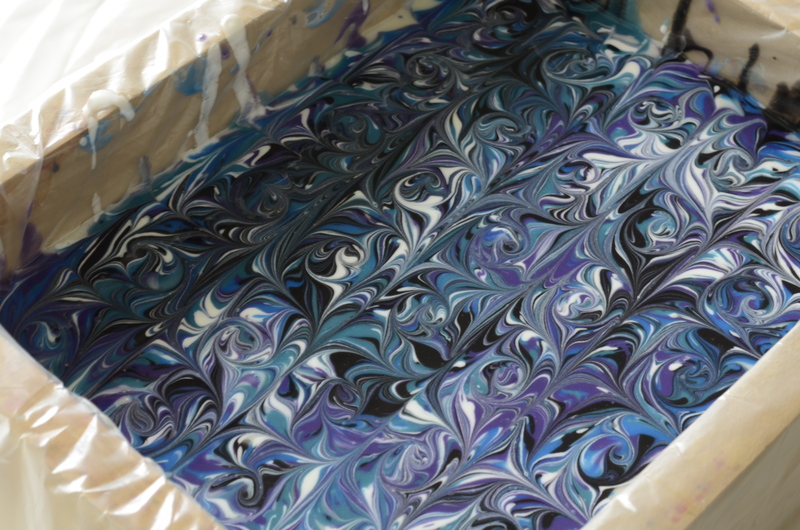 This month when she announced the challenge was using Ebru designs in soap, I decided to join in the fun. 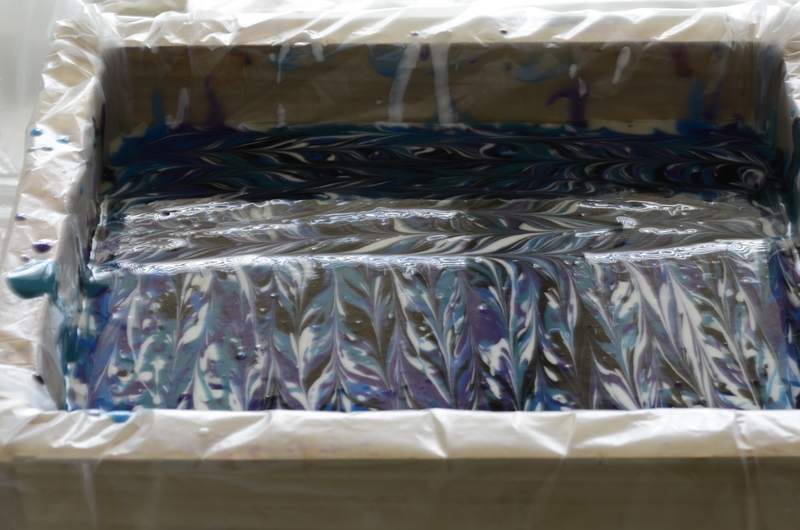 Ebru is actually painting on water and then transferring the design to paper. 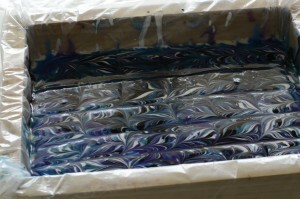 I have made soap before using Ebru designs without knowing it was Ebru – a good example is the peacock swirl. Our challenge was to find an inspiration and execute it in soap. 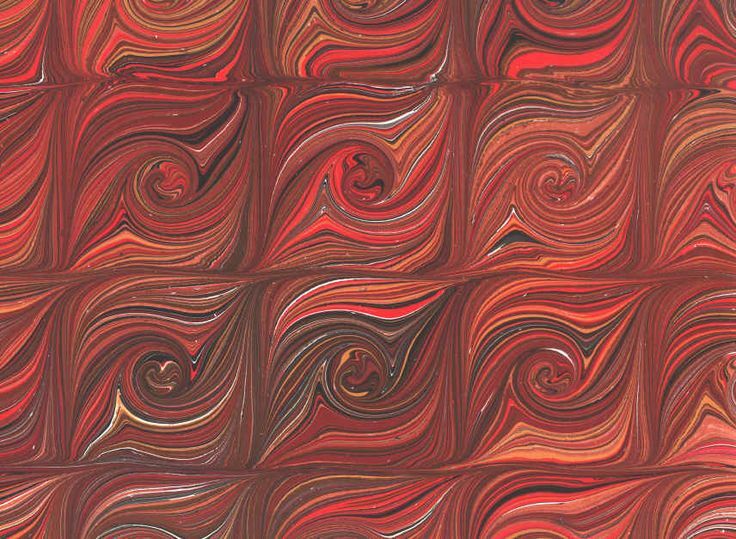 Many Ebru patterns employ a “rake” or other special tools to achieve the look, however, our instructions stated that we must draw the design free hand using a pick or chop stick. 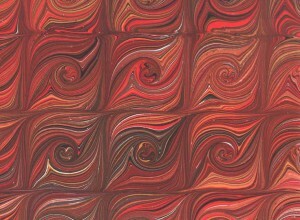 I choose a picture from the website http://marbleart.us/CableCurl.htm. 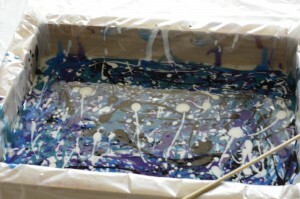 I recommend visiting the site – he has so many different design – I would love to try more. 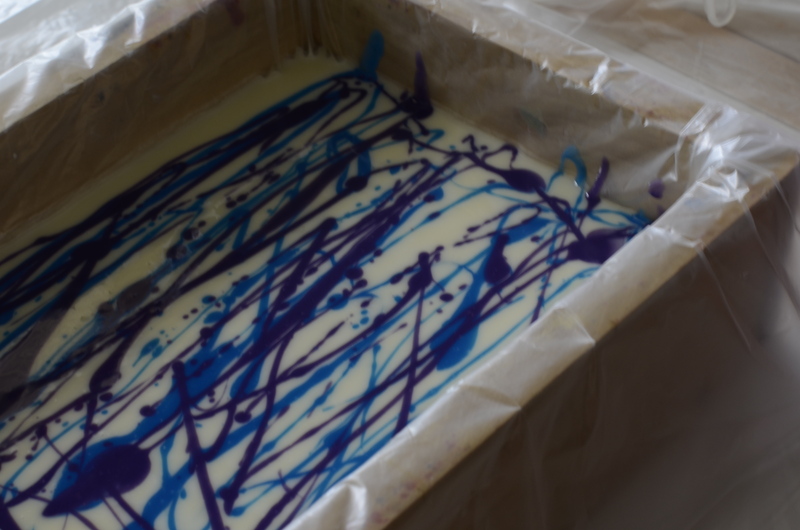 It took me a while to figure out how to do this on soap. I watched a number of YouTube videos and finally decided how I would try to get this patter. Colors ready – teal green, peacock blue, black oxide, cosmo martini, and titanium dioxide to go with the Ed Hardy for Men fragrance I choose. in the process of drawing up and down lines fairly close together vertically and then horizontally. To finish I drew curls in each of the square. wet soap immediately after finishing. I tried a couple other designs but they will have to wait for another day and another post. The deadline to submit our entries is tomorrow afternoon but I will be at the farmers market so my personal deadline is now. 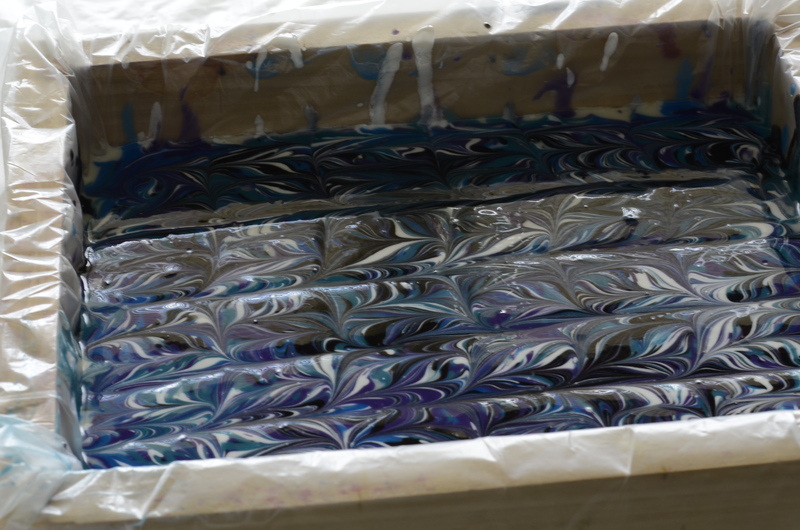 This was so much fun and I am sure I will be re-visiting many of the Ebru sites – it is absolutely fascinating to watch those artist create their beautiful paper. Thank you Amy! Can’t wait to see what you have in store for July. I love your inspiration photo. The symmetrical design is famtastic and you replicated it really well. 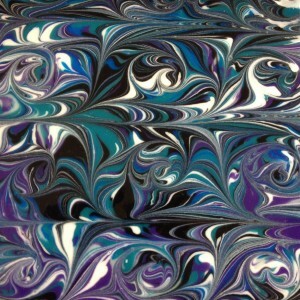 I am going to have a go at this next time I try a swirl. Great entry! I love your color palette! Great job figuring out how to get those swirls in there! Your pattern looks so complex, Bonnie! I’m not sure how you did it, but it’s absolutely beautiful!! Very pretty! 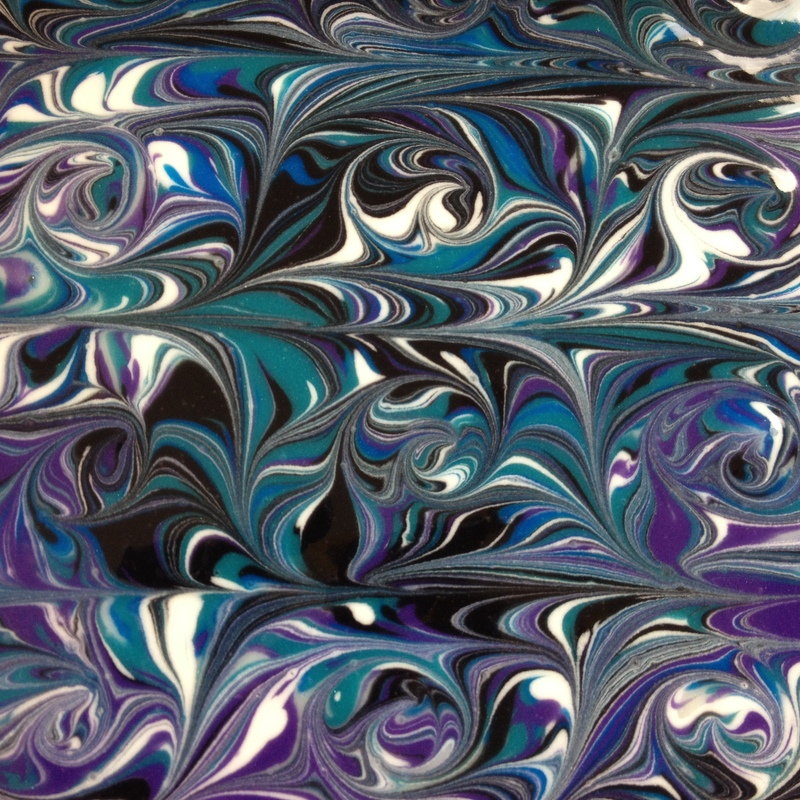 I love the colors and swirl. I want to try this technique at some point, too. Thank you for viewing and the the very kind remarks.